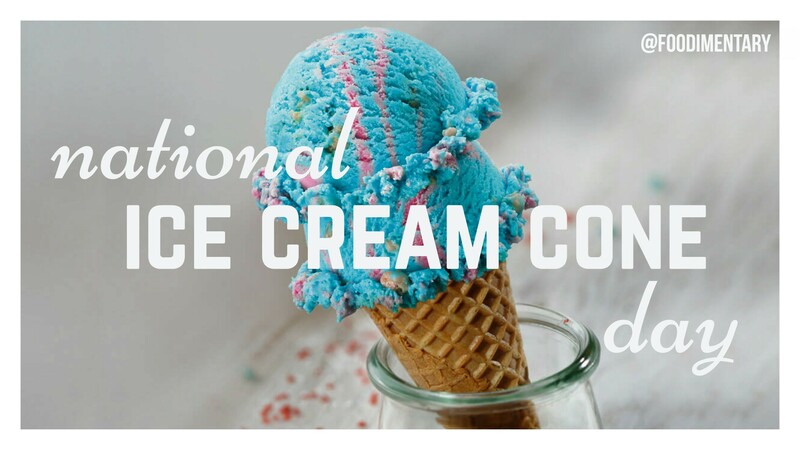 September 22nd is National Ice Cream Cone Day! Edible cones have been mentioned in French cooking books as early as 1825, Julien Archambault describes a cone where one can roll “little waffles”. According to one legend, a Syrian pastry maker, Ernest Hamwian, who was selling zalabia, a crisp pastry cooked in a hot waffle-patterned press came to the aid of a neighboring ice cream vendor (perhaps Arnold Fornachou or Charles Menches) who had run out of dishes; Hamwi rolled a warm zalabia into a cone that could hold ice cream. The first cones were rolled by hand but, in 1912, Frederick Bruckman, an inventor from Portland, Oregon, patented a machine for rolling ice-cream cones. He sold his company to Nabisco in 1928. Nabisco is still producing ice-cream cones, as it has been since 1928. Independent ice-cream providers such as Ben & Jerry’s make their own ice-cream cones. Some brands produce something very similar to the traditional ice-cream cone, but with a flat bottom, which enables it to stand upright without danger of falling. These types of wafer cups are called “kiddie cups”, “cake cones”, or “cool cups”. A variety of cone exists that allows two scoops of ice cream to be served side by side, instead of the usual straight up order. The side-by-side variety has been the standard “double-header” in Australia for many decades, the ‘two-up’ variety is a relatively recent innovation in Gelato shops mostly. 1754 Joseph-Louis Proust born. Proust was a French chemist. In 1799 he extracted sugar from grapes, and proved it identical to sugar extracted from honey. 1774 John Chapman, Johnny Appleseed was born. American pioneer and legend, he planted apple seeds in the Ohio River valley area (Ohio, Indiana, Illinois). 1843 Ivan Pavlov was born. He was the first to notice that dogs began to salivate when they could see, smell or taste food. 1902 Levi Strauss died. Inventor and manufacturer of jeans. He originally planned to make canvas tents for miners in the California gold rush, but soon found that durable pants sold better. 1904 Lafcadio Hearn died. (Patricio Lafcadio Tessima Hearn). A writer, translator and teacher, her wrote ‘La Cuisine Creole,’ the first Creole cookbook. 1914 The U.S. Federal Trade Commission was established.